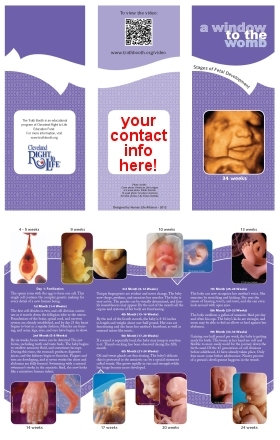 It is strongly recommended that free take-away brochures on fetal development accompany each Display System. The back of the brochure should be stamped with contact information to a local Pregnancy Resource Center. You may use any brochure you choose, however we have produced this brochure to coordinate with the Truth Booth. the brochure yourself, click the link below. Pieces are sent flat, they will need to be folded on the receiving end.